The Arsenal legend looks set to replace Gus Poyet, who was suspended last Friday, and become Bordeaux’s head coach. 41-year-old Henry is keen to try his luck in management. THIERRY HENRY HAS reportedly accepted the offer to become Bordeaux head coach. Arsenal and France’s record goalscorer is eager to take the post vacated by Gus Poyet, who was suspended by the club last Friday following an outburst criticising the handling of the transfer market. Though the Uruguayan remains under contract, he has effectively been pushed out of his role, creating a void that Bordeaux are keen to fill with a high-profile name. Ex-Germany boss Jurgen Klinsmann, who played with Monaco, and Laurent Blanc, who previously won Ligue 1 with Bordeaux, are two names linked with the post, yet Henry is the ultimate goal of the club, who previously tried to offer Zinedine Zidane the opportunity to cut his teeth as a coach in the Gironde. 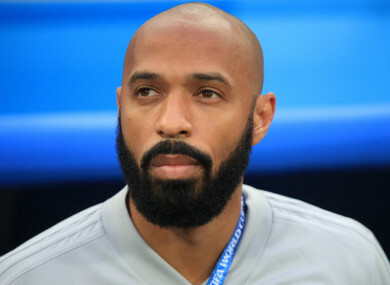 Although Zidane eventually turned Bordeaux down, Henry, who is currently an assistant coach at Belgium and has never held a head coach role, has been in talks with Bordeaux and RMC are reporting that he has agreed to join the club. Fellow Arsenal legend Arsene Wenger, meanwhile, has given his backing for his former striker to take the role. The Stade Matmut-Atlantique side finished sixth in Ligue 1 last term but have made a sluggish start to the campaign this time around. They suffered a 1-0 defeat to Strasbourg on the opening day of the season and then crashed to a 2-1 reverse away to Toulouse in a derby match last Sunday. However, they have made strong progress in the Europa League, winning all six of their qualifying fixtures to date. On Thurday, they face a trip to Gent under the stewardship of physical trainer Eric Bedouet, who is their current interim boss. Bordeaux’s next league fixture comes on Sunday, when they play host to Monaco. Email “Henry reportedly on the verge of taking first managerial job ”. Feedback on “Henry reportedly on the verge of taking first managerial job ”.